The coolest drink of the summer – It’s frosé (that’s frozen rosé)! 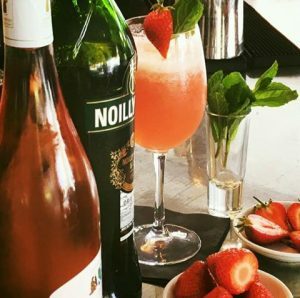 Chilled rosé wine has always been a popular tipple on a hot summer’s day here at The House, but an even cooler version of the pink drink is taking over! Frozen rosé, or frosé, is made by freezing rosé wine with lemon juice and sugar. The resulting concoction combines the sophisticated taste of rosé and the texture of children’s Slush Puppy drinks, meani ng it also invokes feelings of nostalgia bringing back childhood memories. Here at Beaufort House Chelsea, frosé has now become one of our bestselling drinks after adding it to our menu earlier this month. Hannah Cary, Events Manager said that while the drink provided a sense of nostalgia for some drinkers who remember slurping on brightly coloured fruit slushies as children, it also had a universal appeal. Come and join us at Beaufort House Chelsea this summer and try it for yourself. Perfect for a girls night out, partying with friends, or just relaxing in the afternoon sun!